(Nanowerk News) Most people aren't accustomed to hearing "organic" and "semiconductor" in the same sentence. 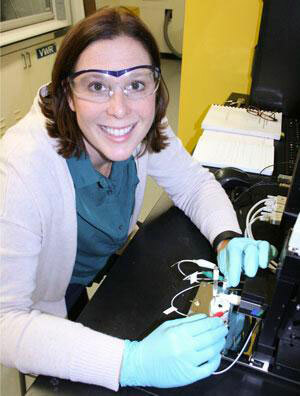 But the words flow naturally for Erin Ratcliff, a University of Arizona assistant professor of materials science and engineering with a chemistry background. Ratcliff is co-principal investigator on a new research project funded by the National Science Foundation to better understand and improve the viability of organic semiconductor materials, which are being used more and more in the manufacturing of digital display screens and new electronic devices. The $590,000, three-year award teams Ratcliff with Jeanne Pemberton, a UA Regents' Professor of chemistry and biochemistry in the College of Science and principal investigator on the study. "I'm incredibly excited to receive this award and to have Jeanne Pemberton as my co-investigator," said Ratcliff, who joined the UA faculty in 2014. "Her research and discoveries in analytical chemistry have led to major advancements in the field." Organic semiconductor materials, or OSCs, are carbon-based molecules and polymers with electrical conductivity. They are used to make organic light-emitting diode, or OLED, digital display screens for mobile phones, TVs and tablets. Future prospects for organic semiconductor materials include solar energy technologies and wearable devices. The global market for all types of OLED displays is expected to grow from nearly $16 billion this year to $57 billion in 2026, according to market research firm IDTechEx. Ultrathin flexible OLED screen displays reflect the latest trend, with revenues forecast to grow from $2 billion to $18 billion by 2020. Benefits of organic semiconductor materials over their inorganic counterparts, such as silicon, include greater transparency and flexibility, reduced cost and fewer adverse environmental effects. However, the degradability of OSCs that makes them easier on the environment can also make them less stable and more likely to degrade in operando -- that is, when they are used in a device. In their study, In Operando Characterization of Degradation Processes in Organic Semiconductor Materials, Ratcliff, Pemberton and UA graduate and undergraduate students in engineering and chemistry are using spectroscopy and other tools to measure and analyze OSCs exposed to different levels of light, heat, gases, moisture and electrical charges under varied conditions to better understand and manipulate the degradation process. "Organic semiconductors hold exceptional promise in a number of existing and emerging electronics and other technologies," Ratcliff said. "But degradation is a major problem for using them commercially. This research project will set a foundation for better understanding and solving this complicated issue." As a collaboration of chemists and engineers, the project stands apart from previous studies of OSC degradation, Ratcliff stressed. "Chemistry researchers have approached the problem by looking only at molecular chemistry. Engineering researchers have focused on device functionality. By combining the skills, expertise and perspectives of chemists and engineers, our project will provide the most complete picture of OSC degradation in operando to date." The NSF project, which started July 1, 2016, is a boon for UA undergraduate and graduate students in engineering and science. Besides working in the Ratcliff and Pemberton labs, participating graduate students will have six-week internships at Next Energy Technologies Inc., a startup based in Santa Barbara, California, that is developing organic semiconductor materials for the solar industry. Ratcliff is also developing a new course, Organic Electronics, for upper-level undergraduate and graduate students at the UA.